Ah. A New Year. When it takes weeks to write the correct date, when you fear the mail because it will bring you your holiday credit card statement and when you have to return to work instead of drinking tea and reading good books all day. Oh and of course there's the resolutions which most people forget within a few days. I decide to do goals instead of resolutions (seems like less pressure). This year, one of my goals is to get back some "me" time. B.H. (that's Before Hannah) I was obsessed with beauty products. The "fun" parts of my paycheque went to nail polish and eye liner...and now it goes to Toopy and Binoo books and Sesame Street soundtracks. 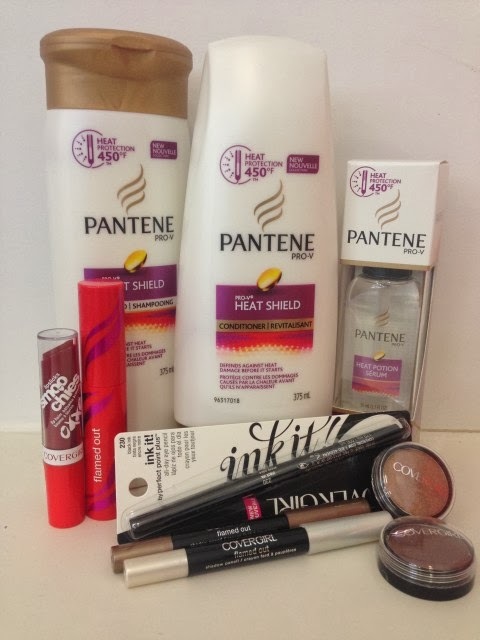 COVERGIRL and Pantene will help me get back into the beauty arena. Now that it's freezing cold outside I blow dry my hair each and every time I wash it. Thankfully with the Pantene Prov-V Heat Shield line protects it. My fave product from the line is the Pantene Pro-V Heat Shield Potion Serum - its formula designed to help protect against 450 heat degree damage (take that blow dryer!) and its heat activated oils provide a protective layer to help defend against heat damage and instantly transform heat damaged hair into soft, silky, manageable hair. My fave new COVERGIRL makeup is a tie between the eye shadow points and the Ink It eyeliner. Both apply easily (aka quickly) and smoothly and last all day! By entering the following contest you are accepting that if you win your contact information will be shared with a P&G PR and shipping agency for the purpose of mailing your prize. Please allow 4-6 weeks from the contest closure date to receive your prize. This giveaway may appear on other blogs as part of the #PGmom program. However, to be fair, you can only win once per giveaway. If your name is chosen more than once, another winner will be selected. All winners must be from within Canada excluding Quebec. Valid entries only. Contest ends January 20th, 2014. For further contest rules, refer to the Terms and Conditions within the Rafflecopter. I want to get my weight under control and get back to healthy eating.....I have let myself go in the past 6 months. My goal is to start saving money. My goal is to learn photography, maybe take a course. my goal is to get more sleep each night. My goal is to reduce the amount of sugar I eat. find a way to not have to go back to work after my mat leave is over! I'd like to drop a few! Also, I'd like to keep up hair maitenance. I've been slacking with hair cuts and colour - both fixed for now! Yes, to be more healthy. My goal for 2014 is to build my new wheelchair by my birthday. I want to lose 40 Lbs! To become more involved in my community! I want to see some results for my suffering on my bathroom scales , 4 days in and I am severely hungry! Spend time watching my newborn grow and learn with my hubby! Spend time watching my newborn grow and learning with my husband! I would like to pay off more of my mortgage this year than in previous years. I would like to spend more time with my kids! I would love to lose 50 pounds! I am becoming a first time mom, so my goal is to be a great mom! I am working on being healthier in 2014! I want to get outside for more walks, hikes and fresh air this year. Mine is to take more time for myself! mine is to love myself more. To incorporate more fruits and vegetables into my diet. I am going to get in shape this year, smile more, laugh a lot more, and spend more family time! My goal is to cook better and healthier meals for my family. My goal is to focus more on my career this year and earn more income. My goal is to eat more Bacon. And to walk 15min a day. Eating healthier to set a healthy example for my children! Maintain a healthy body weight! I want to yell less and play more! My goal for 2014 is to work less and have more fun! To travel somewhere new at least once this year, even if it's somewhere local. I'm hoping to get relief from my chronic back pain! My goal for 2014 is to quit smoking. I hope to keep to my plan on leading a healthy life with exercise and healthy eating habits. my goal is to be more healthy .. smaller healthier food portions, and to exercise more ! My goal is to spend more time with friends in real life and less online!